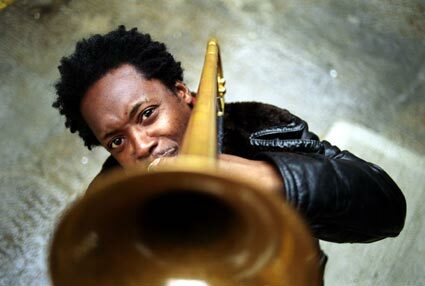 Doncaster based Dennis Rollins is widely regarded as one of the most accomplished trombonists working in jazz and popular music. Over the past 20 years, he has performed with some of the most famous bands on the jazz, soul and pop scenes, including Courtney Pine, Jamiroquai, US3, The Jazz Warriors, Brand New Heavies, Jazz Jamaica, Blur, & Beverley Knight. Dennis was recently acknowledged by Jazzwise Magazine as "the most exciting British trombonist for decades." As well as playing the trombone and many other instruments, he is a gifted composer, arranger and music technologist. Dennis is skilled at the computer, the sampler, and an impressive array of on-stage processing devices. He writes and arranges almost all of the music for his own highly acclaimed jazz/funk band, Dennis Rollins' Badbone & Co. He's also noted for leading workshops and inspiring young musicians across the UK, as well as in West Africa, where he has worked on a large-scale music education project for the British Council. His latest project, 'Griots t' Garage - A Musical History of the African Diaspora', charts the evolution and rich diversity of Black music from historic times to the present. Dennis Rollins combines sampling technology with improvisation to create a colourful collage of sumptuous aural textures and patterns.